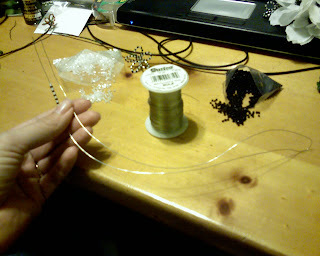 First start with about 24 inches of 24 gauge non-tarnishing silver wire. This length will leave you with about a 7 inch stem. If you need more or less, you can adjust that measurement. 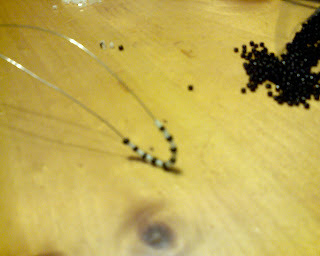 ...and add the beads while holding both strands of wire. 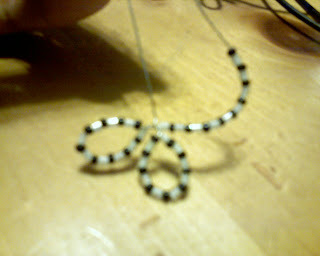 I used 18 seed beads, 9 white, 9 black. 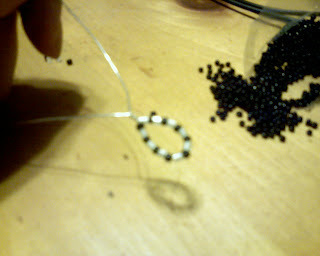 Let the beads slide down into the center of the U bend. 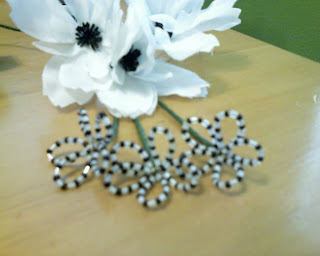 Tightly twist 2 or 3 times to make your first petal. 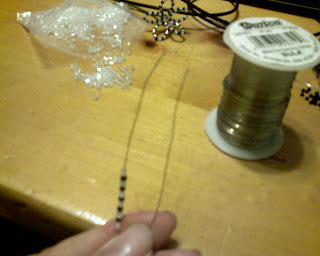 Now you only need to hold 1 strand of wire to add 18 more beads. Let them slide down to the first petal. 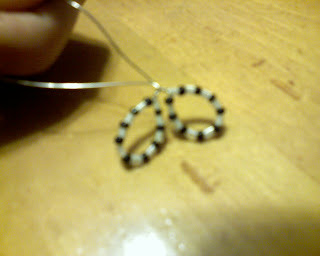 And twist tightly, again 2 or 3 times, close to the first petal. 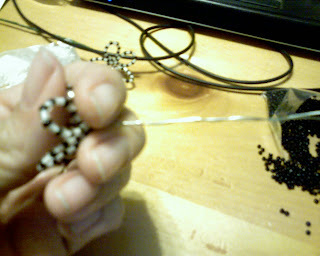 Now take the other strand of wire and make the third petal the same way. Keep doing this until you have 5 flower petals. 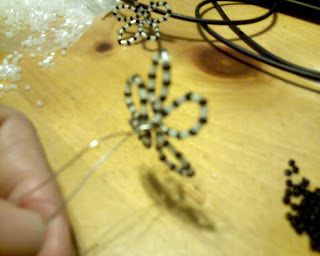 Then twist the two wires on the bottom side of the flower tightly 2 or 3 times. 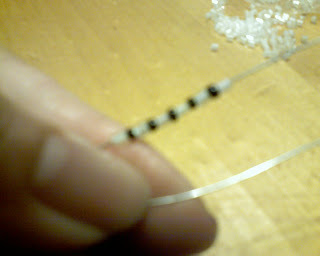 Gently grasping under the flower, twist the remaining wires on themselves to creat one single stem. 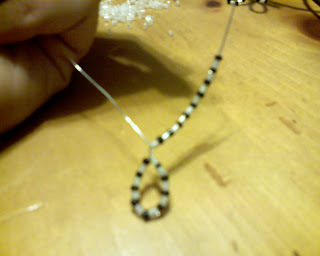 This only needs to be "pretty" if you are leaving the wire bare. 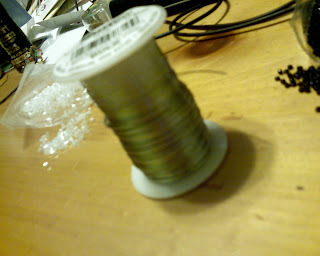 Trim the ends of the wire to make even. 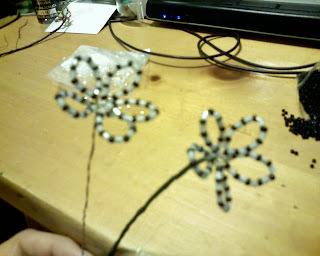 Pictured here is a flower on the left without floral tape and on the right with floral tape. 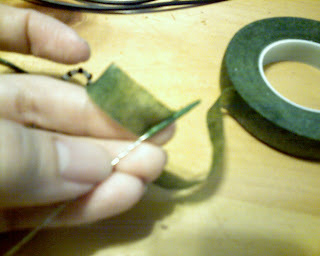 To wrap the floral tape, I find it to be easier to start at the base of the stem and work back up towards to flower. Wrap tightly, but don't worry too much about perfection. These aren't stand alone type flowers and the stem will most likely be covered up by greenery or ribbon or something else. These are just accent flowers. 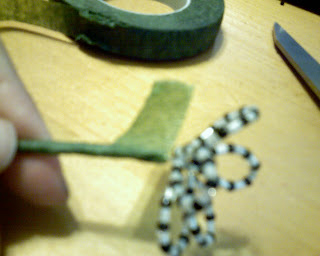 When you get to the flower, tear the tape and wrap tightly as close to the base of the flower as possible. Smooth well.